We're very excited to announce we have been offered a stall at Haigh Woodland Park Artisan market this coming Sunday the 21st October. We will be there from 10 am with plenty of unique hand made dog coats for sale plus plenty of other dog related craft items. Three year old Jamie arrived with us back in the summer. Now we have got to know him we have found him to be a very sweet natured lad who is affectionate with all our volunteers. He is a small lad for a male, he loves to play too. Jamie recently spent a weekend with foster carers and they report he was well mannered, easy to walk and was in fact a pleasure to have in the house. This lovely boy is now ready for his forever home and we are looking for an adoptive household without any other dogs, ideally with someone who has experience of larger dogs. If you would like to find out more about Jamie featured here please contact either Sue our re-homing co-ordinator on 07794463249 or Siobhan at kennels on 07960561988. 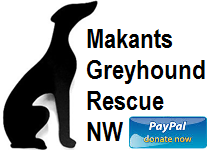 Alternatively you can complete our homing form on our website www.makantsgreyhoundrescue.co.uk which can be found under the ‘adopt/foster’ tab. One of our homing team will then get in touch with you. Burgess Pet Care recently decided to donate a large amount of food to greyhound rescues and we were delighted to be one of the chosen winners. This morning our delivery arrived all the way from York courtesy of staff members Yasmin and Josh. We send our thanks to Burgess Pet Care and to you, our supporters, for nominating us too. Such a large amount of high quality food will make a significant difference, reducing our food bills for some time to come. We have yet more homing news to share with you today supporters and this time it's ROSE. This lovely girl, now known as ROSIE, will live with Sarah and Andy and their children Joe and Harry in the Gatley area. We wish them every happiness for their future together. We have news of our second homing of the week to share with you today, this time it's CHAP. This lovely lad, now known as SILAS, has been homed with Kat and Chris and their children Daniel, Annalise, Evie and Harrison in the Bolton area. We wish them all every happiness for their future together. We also send our thanks to our foster carers Jess and Andrew for their help once again. Thanks to all our supporters who came and took part in our third social dog walk today at a new venue for us - the Crooke Hall Inn in Crooke Village near Standish. The weather, while being a bit miserable, wasn’t the heavy rain we were expecting - thank goodness! We send our thanks to: Dean and staff at the Crooke Hall Inn, to Jo and Shelley for organising the walk, to Celine for photos and to all who attended for helping us raise funds for the hounds in our care. We start the week the very best way, with news of a homing and this time it's Robin! Robin, now known as Luna, will live with Jamie and Kate in the Bolton area. We wish them all every happiness for their future together. Manythanks to our volunteers Dave, Wendy and Martin who were ably assisted by their adopted Makants hounds Jake, Kate and Heston. Thanks also to all who stopped to chat on such a wet day. Our Friday Feature this week is three year old FAB. Fab has only been with us for a couple of weeks but we already know what a lovely friendly girl she is - and is so easy to walk too. She looks forward to her daily walk with the other greyhounds and is respectful towards other dogs she meets when out and about. Fab does have a good appetite, so much so even her recent spaying operation didn’t put her off her tea! She is settling in well in kennels and appears to be taking the new big wide world in her stride. If you would like to find out more about Fab featured here please contact either Sue our re-homing co-ordinator on 07794463249 or Siobhan at kennels on 07960561988. Alternatively you can complete a homing enquiry form which can be found on our website www.makantsgreyhoundrescue.co.uk under the 'adopt/foster' tab. We have news of another homing to share with you today and this time it's DORA (the explorer)!